Shark detection device under testing. Shark nets and aerial searches to protect the nation’s beachgoers may become costly relics of the past if digital technology able to detect the potentially menacing creatures succeeds. 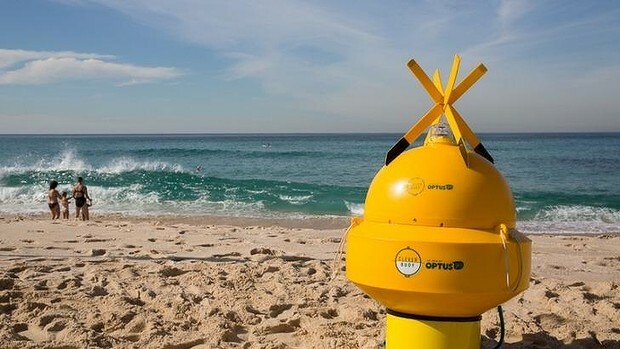 Dubbed the “Clever Buoy”, the floats use sonar devices to search for objects of greater than two metres in length approaching within about 60 metres. If confirmed as a shark, the device will send an alert via satellite to beach-based lifeguards who would then evacuate swimmers. Shark Mitigation Services (SMS), which has tested the technology at the Sydney Aquarium and at the remote Abrolhos Islands off the WA coast, hopes to release commercial versions by the middle of next year. “It’s like face-recognition software,” said Hamish Jolly, a director of the company. 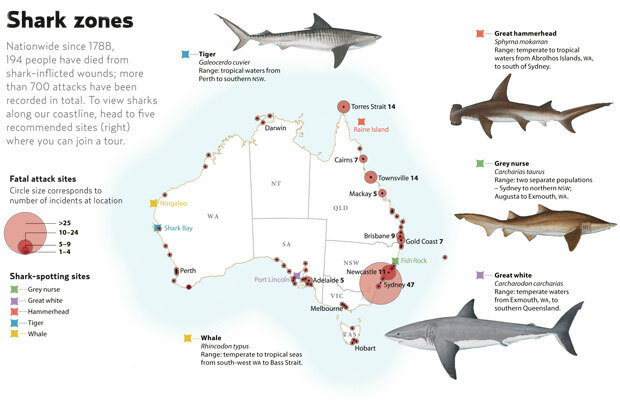 If the WA experience is any guide, governments could do with more accurate methods to identify and respond to shark threats. Bowing to public fears after a series of shark deaths off WA beaches, the WA government began culling sharks in January and is seeking a three-year extension from federal environment minister Greg Hunt. The cull, though, failed to catch a single great white shark – its main target. Many of the 172 sharks caught were tiger sharks, which have not been linked to recent human fatalities. An interest in shark conservation was one reason why telecoms provider Optus teamed with Mr Jolly’s company to provide satellite expertise for the buoys. “We want to provide the environment that’s safe for beachgoers but also provides the opportunity to protect sharks long-term as well,” Nathan Rosenberg, head of Brand and Communications for Optus, said. Shaun Collin, head of the University of WA's Oceans Institute - which has worked with SMS on other research - said the presence of a shark "certainly does not mean an attack is imminent". The way forward is to quickly identify any potential risk, convey that to the public while also deploying a deterrent to ward them off, Professor Collin said. World-leading shark scientists at the University of Western Australia now understand exactly how sharks see. In collaboration with the university, SAMS has also translated the scientific data into a range of patented shark deterrent and repellent wetsuits, along with other products now available online. The use of satellites rather than mobile phone networks would allow the buoys to be anchored off remote beaches in Australia and elsewhere. “We want to be able to deploy this anywhere in the world,” Mr Jolly said, adding that Hawaii and Reunion Island in the Indian Ocean were among possible markets. The final cost of the buoys, developed using Google platforms, remains unclear. Although sharks remain a tiny threat for most ocean swimmers - the number of unprovoked shark encounters a year has doubled since the 1960s to about 80 worldwide – local authorities are going to invest to reduce the risk, he said. “At the moment, the alternatives are aerial spotting, netting and visual patrols from lifeguards,” Mr Jolly said. A rise in deaths is understood to be largely down to more people entering shark space. The recovery of whale numbers, such as humpbacks, is also likely to raise shark bite risk, according to a study out earlier this year by Peter Sprivulis, a professor of emergency medicine at the University of WA. NSW has recorded 47 fatalities from sharks in the past 100 years, including the death of Christine Armstrong off Tathra in April, according to Taronga Zoo’s Shark Attack File. For Victoria, the last death from sharks was in 1987 on the Mornington Peninsula, with four fatalities in the past century. WA’s shark deaths total 19 during that time. Tests now underway are to extend the operating life of the systems – batteries now need to be replaced each day – and to determine whether the most effective use involves lines of buoys creating a virtual perimeter fence.